Releasable Zip Ties | Reusable Cable Ties | Cal Fasteners, Inc.
Releasable zip ties are ideal for temporary or permanent bundling. They allow for the quick addition or removal of wires or other items without the need for cutting tools and replacement ties. Cal Fasteners offers 50-pound capacity releasable zip ties in various lengths to meet your requirements. Strap-aligned finger release latches provide easy access and reduce snags compared to top-mounted latches. These releasable cable ties feature one-piece construction and special pawl and teeth designs that improve tensile strength. Tapered tails with finger grips make handling and alignment easy, while low insertion and pull through forces allow for effortless tightening. ROHS compliant. 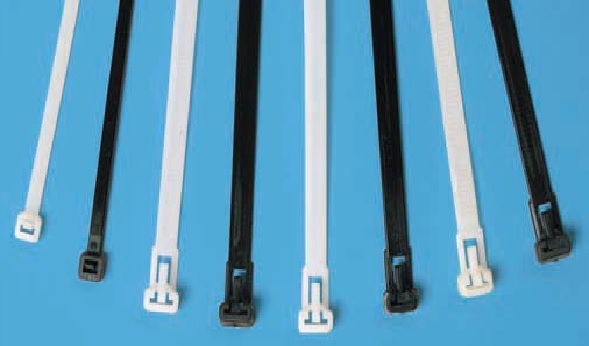 Request a quote on the releasable zip ties you need, or contact Cal Fasteners to learn more.